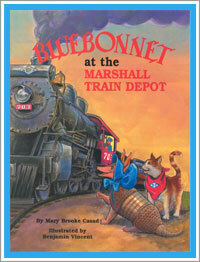 Bluebonnet, the travelling Texas armadillo, arrives in the Marshall, Texas, town square early one morning. She sees the beautiful lights from Marshall’s “Wonderland of LIghts” festival, but it is not the festival that Blubonnet has come to see. Here curiosity has brought her to Marshall in search of the historic Marshall Train Depot. Just as Bluebonnet starts to wonder how to get to the depot, Bluebonnet meets T.P., a local cat who is named for the Texas & Pacific railroad. Because he works for the railroad by ridding the depot of mice, T.P. offers to take Bluebonnet on a tour, and she gladly accepts. 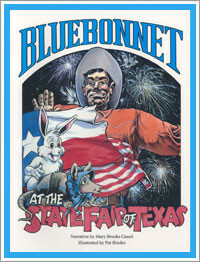 Together, Bluebonnet and T.P. experience the excitement of steam engines, the history of the depot, the Ginocchio Hotel, and the recently completed restoration of the depot. A playful friendship develops between them, which ultimately takes them on their very first train ride.